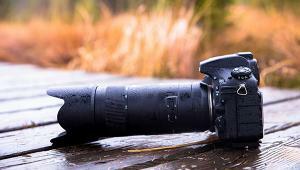 In its classic sense, macro photography enables the capture of 1:1, life-sized images of subjects. 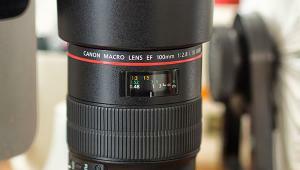 Unfortunately, “macro” gets thrown around loosely in the marketing language used by lens makers, describing most any lens with respectable close-focusing capability. 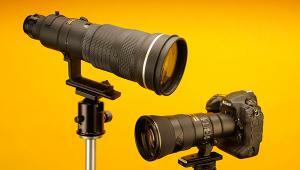 But true macro lenses do exist, enabling real 1:1 magnification…and one lens goes well beyond. Canon’s 65mm MP-E offers up to 5:1 magnification, making it more like a microscope than a lens, and should be considered one of the premiere tools on the market for serious close-up work. For example, while any macro lens allows filling the frame with an insect, the MP-E allows filling the frame with its eye! Fisheye lenses sit at the extreme wide-angle end of the focal length spectrum, producing images with significant barrel distortion. Although fisheye primes can be found in virtually every lens maker’s lineup, fisheye zooms are relatively new. Tokina is the latest to offer such a zoom, joining Pentax and Canon who both offer similar models. The ability to quickly change focal length while retaining the fisheye look—for enhanced drama, artistic expression, or even humorous effect—is something to be appreciated by serious fisheye photography veterans, certainly, but perhaps even more by novices who will find experimentation easier with a zoom than with a prime. Experienced portrait photographers are no strangers to soft focus and its advantages in creating flattering images. Canon’s 135mm f/2.8 Softfocus lens would be an ideal portrait lens even without its added bonus: the choice to shoot unaltered and sharp or with either of two soft-focus settings. The market is packed, of course, with glass filters to accomplish the same ends (to say nothing of photo-editing software), but there’s something to be said for capturing images the way you want in camera and without fumbling with filters. If nothing else, having three effects built right into the lens speeds workflow, an innovation welcome to any photographer. 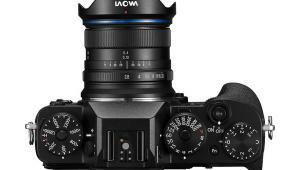 A couple of years ago, Leica discontinued its 50mm f/1.0 Noctilux only to replace it shortly after with a new model—substantially improved and even faster at f/0.95. Consider that even professional zooms max out at f/2.8, more than three stops slower than f/0.95. Put into perspective, that’s more than the difference between ISO 200 and 1600, more than the difference between 1⁄60 and 1⁄8 sec shutter speeds. The new Noctilux approaches the speed of the custom f/0.7 lens used by Stanley Kubrick to shoot the famed candlelit scenes in Barry Lyndon and is currently the fastest aspherical lens available (though Cosina-Voigtländer has announced an f/0.95 lens of their own). While the Noctilux enables remarkable low-light performance, it’s also worth remembering that it offers the shallowest depth of field of any normal lens, making it the most powerful weapon available in the arsenal of shooters who love selective focus photography. The search for point-and-shoot cameras for pros has been ongoing. The problem that every camera maker runs into, however, is trying to balance image quality against versatility against camera size. Ricoh’s new GXR tackles the problem by combining a sensor and lens into a single, but swappable, module. 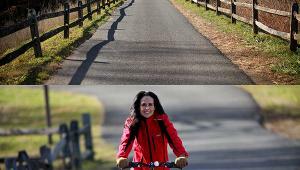 Currently, Ricoh offers a standard zoom (24-72mm, 35mm equivalent), a superzoom (28-300mm, 35mm equivalent), and a normal, macro prime (50mm, 35mm equivalent). Anyone who has ever wondered what it would be like to affix a peephole to their camera may find their dream lens in Sigma’s 4.5mm circular fisheye. Currently among the widest-angle lenses on the market, it produces a circular image with heavily-distorted proportions and a remarkable 180˚ view. Photographers wanting to get stealthy while retaining D-SLR image quality will find Pentax’s 40mm pancake lens intriguing. Protruding barely more than half an inch (0.59”), this lens makes a D-SLR as inconspicuous as a rangefinder. The 60mm focal length (35mm equivalent) is tasty, too—nearly as suitable for street photography as more commonly-used 35-50mm lenses while being better suited to candid portraiture. 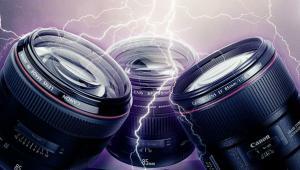 The fastest lenses are always near the normal focal length of 50mm (35mm equivalent). Departing from the normal focal range in either direction creates increasing optical challenges in creating lenses with wide maximum apertures. Most lenses at the extreme wide-angle or extreme telephoto ends of the spectrum, for example, have maximum apertures of f/5.6 or even f/8. For these reasons, Nikon has made a remarkable achievement in creating a 200mm lens with an f/2.0 aperture, a full stop or more faster than most primes offered at that focal length (let alone zooms). Being able to shoot wide-open at f/2.0 would be prized by portrait, wildlife, or sports photographers who either must often shoot in low light or who are looking for very shallow depth of field. 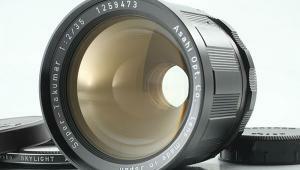 As glass technology has improved, zoom lenses have made huge strides to close the image quality gap with primes. These innovations have enabled new standards in jack-of-all-trades superzooms, single lenses whose focal range enables a staggering array of compositions from a single vantage point. 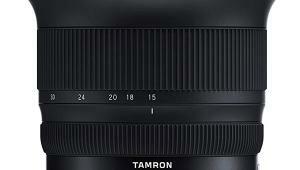 Tamron’s 18-270mm (28-419mm, 35mm equivalent) is ideal for photojournalists and backpackers wanting to travel light. Not only can they leave their bag of lenses at home, but also miss fewer shots due to lens swaps. 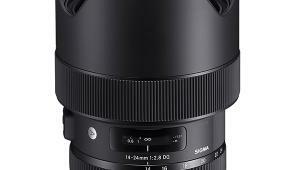 As lens makers compete to create superzooms with ever-increasing focal ranges, most are trying to squeeze in a few extra millimeters of range in either direction from “normal.” Sigma, however, has planted a flag in a different battlefield, recently introducing two superzooms at super-telephoto lengths. 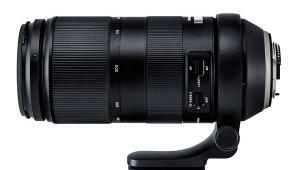 Sigma’s 50-500mm and 300-800mm models combine super-telephoto reach with the ability to change composition in seconds rather than minutes, an advantage particularly valuable in certain situations. Sports photographers shooting soccer or surfing, for example, must react to quickly changing events and even anticipate where action will occur, all from a single, often quite restricted, vantage point. Similarly, wildlife photographers will appreciate being able to zoom quickly when shooting subjects that require them to keep their distance either because they’re skitterish (think birds) or dangerous (think tigers). 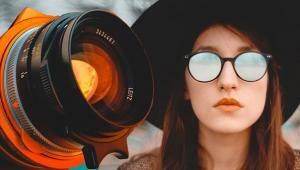 While most lens makers strive for ever-greater technical perfection in their glass, Lensbaby encourages shooters to explore the whimsical side of photography. 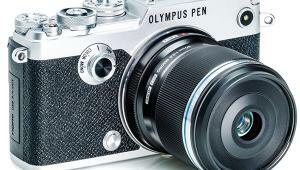 Bending the lens barrel produces distorted images with very shallow—and uneven—depth of field. Think of a Lensbaby as an inexpensive tilt-shift lens for the anarchist in any photographer. Some photographers take even their whimsical shooting seriously, however, and Lensbaby’s Control Freak model enables finer control. Photographers can lock the bend in the lens roughly where they want it with a push button and then fine-tune the bend using three fingertip posts while touching up focus using a manual focus ring. Thank you very much for your review. 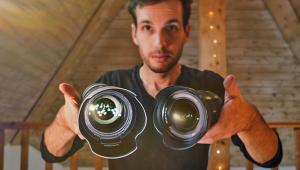 After reading your review it I want this lens. It is perfect for me.